Apache Tiles and SiteMesh frameworks uses Composite View Design Pattern. You want to build a view from modular, atomic component parts that are combined to create a composite whole while managing the content and the layout independently. You want common subviews, such as headers, footers, and tables reused in multiple views, which may appear in different locations within each page layout. For example, the portal sites that include numerous independent subviews, such as news feeds, weather information, and stock quotes on a single page. The layout of the page is managed and modified independently of the subview content. Another benefit of this pattern is that web designers can prototype the layout of a site, plugging static content into each of the template regions. As site development progresses, the actual content is substituted for these placeholders. This approach provides improved modularity and reusability, as well as improved maintainability. Below is the class diagram representing the relationships for the Composite View Design Pattern. Client - A Client dispatches to a View. View - A View represents the display. SimpleView - A SimpleView represents an atomic portion of a composite whole. It is also referred to as a view segment or subview. CompositeView - A CompositeView is composed of multiple Views. Each of these Views is either a SimpleView or itself potentially a CompositeView. 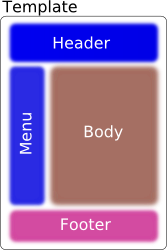 Template - A Template represents the view layout. To understand this pattern, let's take an example. 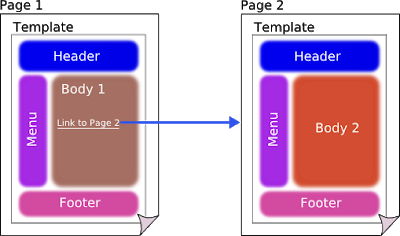 In the following picture, you can see a typical structure of a web page. This structure is called "Classic Layout". The template organizes the page according to this layout, putting each "piece" in the needed place so that the header goes up, the footer down, etc. It can happen that, for example clicking on a link, it is needed to change only a part of the page, typically the body. As you can see, the pages are different, but their difference is only in the body part. Note that, however, the pages are distinct, it is not like a refresh of a frame in a frameset! Using the composite view pattern, the other part of the page has been reused, and the layout consistence has been preserved. In this example, View management is implemented using standard JSP tags, such as the jsp:include tag. Using standard tags for managing the layout and composition of views is an easy strategy to implement. Apache Tiles is a free, open-source templating framework purely built on the Composite design pattern. In Apache Tiles, a page is built by assembling a composition of subviews called Tiles.